Personally, I love cats. (I love dogs, too, but I happen to have two cats.) Or, I should say, the cats have me. One can never really say that one owns a cat; it's the other way around. Let's face it - when a cat takes up residence with you, that cat owns you. You might want to deny it, but most honest cat loves admit (sheepishly) that they are owned by their cat(s). I'm one that fits into the category of liking to receive gifts for my cats, rather than some cat-themed figurine or cookie jar. Some great gift ideas for cat lovers (who like gifts for their cats) can be found online at one of the many merchants or catalogers that specialize in pet products. One product that has become the hottest rage is the automatic kitty liter pan; as the saying goes, "It really is the cat's meow!" It does everything�automatically "rakes" the litter, empties it into a receiving pan and keeps the box neat and clean. Many websites offer this amazing litter pan. (They are not cheap�but well worth the price for the convenience!). Other items include colorful, cat safe collars and identification tags as well as countless toys designed to stimulate your cat's curiosity and desire to chase things�both real and imagined! Many cat lovers would appreciate a year's supply of their monthly cat medication - or a stock of important cat first aid items. This many not be a "glamorous" gift, but it is truly thoughtful and will never go unused or unappreciated. Of course, there are feeding and water dishes and many automatic models that can ensure that your beloved feline has a constant supply of fresh water and dry food. Because of today's busy lifestyle, many people are opting to have their four legged companions be of feline rather than canine breeds; the obvious advantage being not having to take a cat for a walk. Food, water and lots of love are all they need. Manufacturers of pet products recognize this and are constantly coming up with innovative products to make your life and the life of your cat easier. Aside from items created specifically for a cat's use, there are those gift ideas for cat lovers that do include people gifts, such as cat-themed photo albums, picture frames, door mats and welcome signs. There are also a multitude of cat themed serving dishes (for people), jewelry items (like charms and bracelets and a wonderful assortment of earrings), kitchen ware as well as towels and shower curtains. 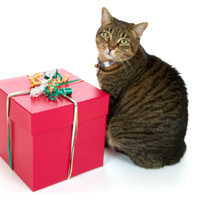 You name it and you'll be able to find unique gift ideas for cat lovers online at the many merchants and catalogers listed in the gift category. From absolutely realistic cat figurines, to soft to the touch cat pillows and blankets or throws�if you're looking for truly unusual gift ideas for cat lovers, let your mouse do the walking! The internet is a fabulous source for all things that would delight any cat lover. Until you start searching you probably have no idea just how much is available. And what is so great is that the prices are reasonable. Obviously, some items (like fine crystal and china) can be somewhat high, but they are very competitive when compared to what you'd pay in a retail establishment. Adorable crystal salt shakers and napkin rings are also wonderful gift ideas for cat lovers and make great stocking stuffers, too. And, speaking of Christmas stockings, there is no better way to make cats meow with glee than getting several of the Christmas stockings that are filled with all sorts of treats for even the pickiest of felines. From tasty treats to irresistible toys, the assortment available online is seemingly endless. They're inexpensive, too. So, be sure to include this item when you're considering gift ideas for cat lovers. Another thing to consider is to make a donation to your local humane society in your name and your cat's name. These organizations do so much to help abandoned cats (and dogs and other creatures) who have been left behind or have been cruelly treated in other ways. The humane society (or other animal shelters) will notify the person that a gift has been made in their name or you can send a card with the happy news! Whatever gift ideas for cat lovers you decide and whatever your budget is, you cannot go wrong by shopping online. Most internet merchants offer gift wrapping and speedy delivery. Make sure, however, that when ordering online you check to make sure that the order page is secure. Check for the secure symbol before giving credit card information. Your online shopping experience will not only be fun, but you can rest assured it will be safe.